B.A. 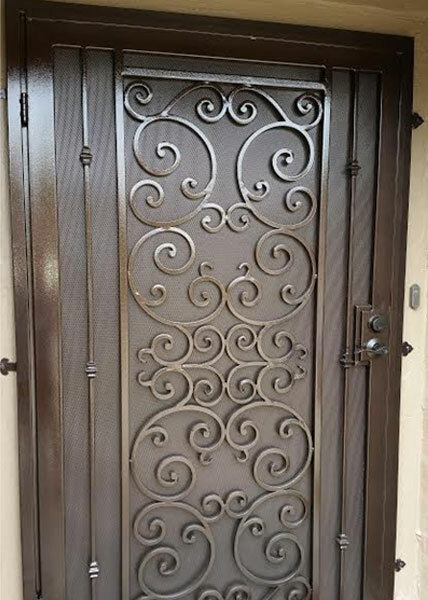 Ramirez & Sons Ornamental Iron Works, Inc. creates custom fences, gates, railings, security doors, and window guards for Escondido out of quality ornamental and wrought iron at cost-effective prices. We have over 30 years of experience providing thousands of commercial and residential customers with beautiful, highly functional, and lasting ironwork. As a testament to our exceptional workmanship, most of our business comes from returning customers and referrals. At B.A. Ramirez & Sons Ornamental Iron Works, Inc., we stand by our iron work with written warranties. We can handle iron fabrication and installation projects of any size, and also welcome repair and replacement services. Before we begin any work, we'll talk with you about your goals and give you an upfront estimate. We can customize our services to fit nearly any budget, and ensure that your iron fence, railing, door, gate, or window bars will meet all applicable homeowners association CC&Rs, municipal building codes, and ADA standards. Call family-owned and -operated B.A. Ramirez & Sons Ornamental Iron Works, Inc. today for the best value in high quality commercial and residential iron work services in Escondido. We offer free online estimates. If you schedule an on-site consultation, we'll answer your questions, walk your property, take measurements, and thoroughly discuss your iron fence, railing, gate, door, or window guard needs in Escondido. B.A. Ramirez & Sons Ornamental Iron Works, Inc. holds a valid ornamental iron contractor license and is bonded and insured. With decades of experience installing ornamental and wrought iron fences for homeowners and businesses, B.A. Ramirez & Sons Ornamental Iron Works, Inc. has the expertise to build beautiful, lasting iron fences for any need in Escondido. We've built security fences, perimeter fences, pool fences, wall-mounted fences, pet enclosures, decorative enclosures, and more on properties of all sizes throughout San Diego County. All of our fences and gates are fully customizable to suit each customer's unique preferences and budget. From a simple iron picket fence to a highly ornate fence with hammered scrolls and spear tops, our custom iron fences can support all kinds of security, privacy, and decorative fencing needs in Escondido. Call B.A. 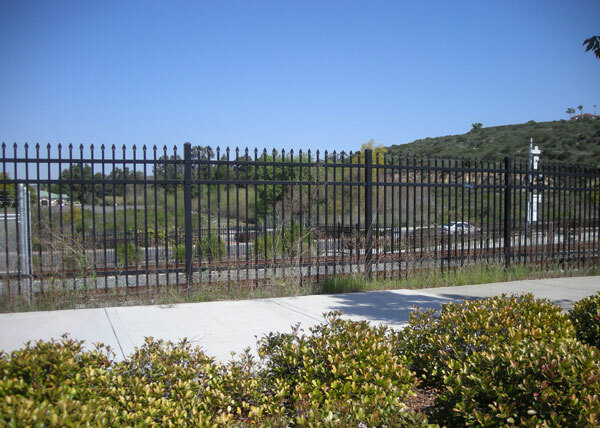 Ramirez & Sons Ornamental Iron Works, Inc. today to custom-design, build, and install the iron fence you desire for your Escondido home or business. We also offer cost-effective repair and partial replacement services for fences in Escondido. B.A. 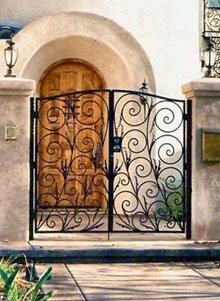 Ramirez & Sons Ornamental Iron Works, Inc. can design and custom-build the perfect iron gate for your Escondido home or business. Whether you would like a simple access gate, a stately driveway gate, or a stylish but effective iron security gate, our ironworkers will meet or exceed your expectations. 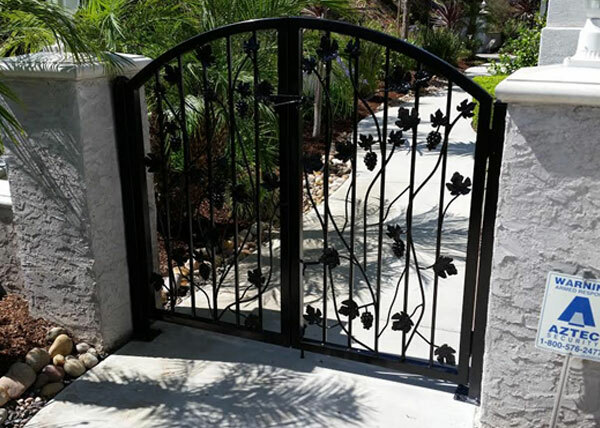 Our craftsmen have decades of experience designing, crafting, and installing gates, so they know how to give our Escondido clients a lasting, well-built gate to complement any type of home or business while working within specified budget restraints. We work with both tubular and solid iron, offer hand forged work and ornate casting, and carry a wide selection of iron finishing options. 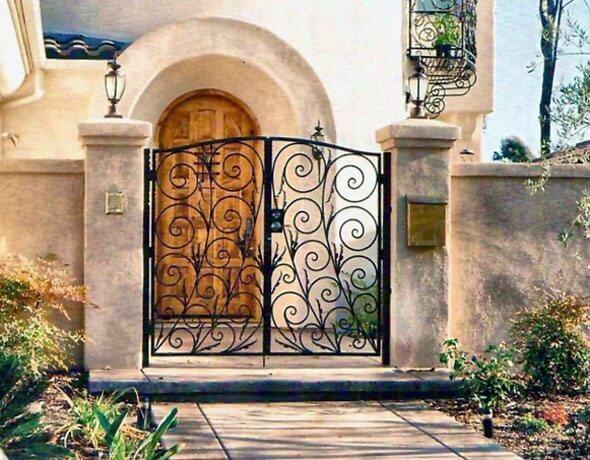 In addition, we can design your iron gate in Escondido with key locks, latches, levers, knobs, phone entry systems, keypad systems, card readers, proximity readers, automated gate openers, and more. We use the market's top brands, such as LiftMaster, RamSet, and DoorKing, but can also place custom orders. Call B.A. 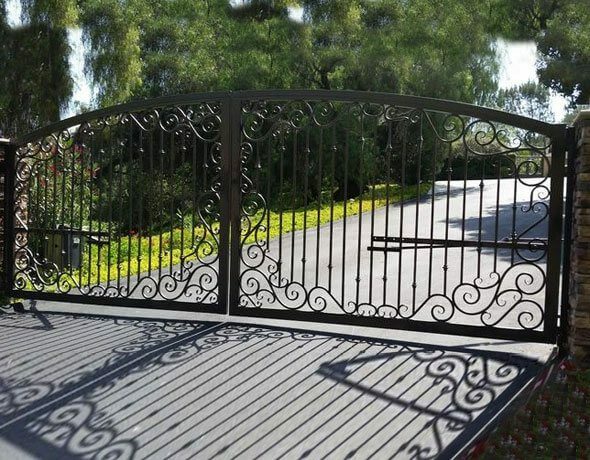 Ramirez & Sons Ornamental Iron Works, Inc. today and we'll expertly design and install your Escondido driveway, garden, entry, or motorized gate at a fair price. If you are looking to install or replace an automated gate at your Escondido home or business, make sure you choose a reputable and experienced contractor. Automated gates--also called electric, automatic, or motorized gates--play an important role when it comes to convenience, safety, and security. A good quality automated gate should not only look attractive, but also open and close smoothly, withstand frequent use, and feature reliable safety features, such as vehicle detection loops and "photo eye" sensors. By choosing to work with B.A. Ramirez & Sons Ornamental Iron, we'll ensure that you are making well-informed decisions for every aspect of your gate, from the choice of the iron to the security access system and motor, so that you are sure to be satisfied in the long-run with your investment. We not only have 30 years of experiencing installing new and replacement gates, but we also frequently repair existing automated gate systems and hardware. 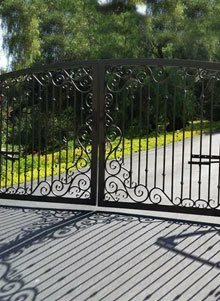 Whether you are looking to add a new gate to your driveway or want to restore an existing iron gate in Escondido, give us a call today. B.A. 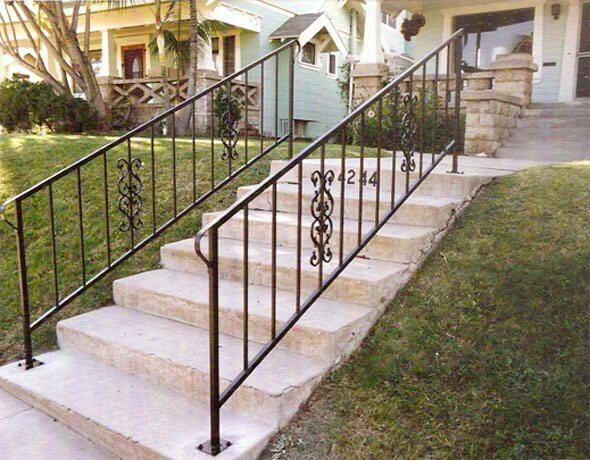 Ramirez & Sons Ornamental Iron Works, Inc. custom-designs, installs, repairs, and replaces all types of iron railings, including railings for balconies and staircases, handrails, and guardrails, for residential and commercial properties in Escondido. 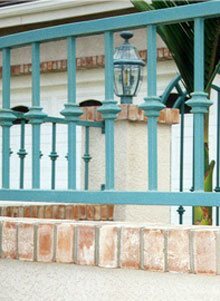 Our iron railings are available in any design, from the simple to the highly ornate, and we can be trusted to strategically enhance the look of your Escondido home or business. 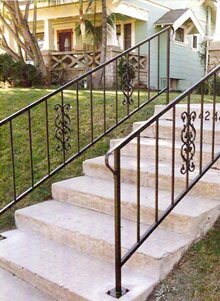 We specialize in decorative railings, such as railings with hand-forged scrolls and hammered pickets with baskets, knobs, or knuckles, but are also able to build railings, handrails, and guardrails that are in strict compliance with building and safety codes, ADA standards, and HOA CC&R requirements. Call today for a free consultation. Providing effective security for your home, business, or commercial property does not have to come at the expense of your home or building's appearance. At B.A. Ramirez & Sons Ornamental Iron Works, Inc., our highly skilled craftsmen can be trusted to custom-design, build, and install iron window bars/guards or doors that will perfectly complement your property while deterring trespassers. Each window guard and door features hand-forged ironwork and can be embellished with beautiful casted iron designs. By hand-forging each piece, we can realize your unique vision or replicate a design you've seen in a magazine or on another property. Additionally, we can protect your ironwork from rust with a hot-dipped galvanization, metallization, or baked on powder coating treatment. Window guards are installed with fire-code approved emergency release mechanisms and doors can be installed within a door frame or a few feet away from your front entry door to create a small enclosure. We offer a large selection of hardware (knobs, handles, etc.) and security control systems, but can also install equipment you've found elsewhere. Call us today for a free onsite consultation and estimate. At B.A. 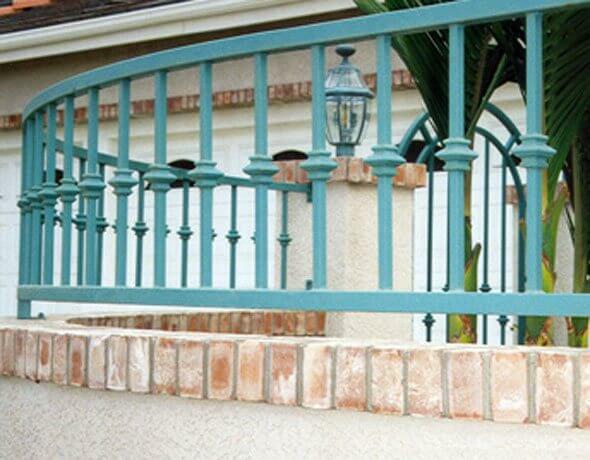 Ramirez & Sons Ornamental Iron Works, Inc., we work closely with our residential customers to design iron fences, gates, railings, and window bars that will provide the perfect complement to their homes in Escondido. As a full-service ornamental iron contractor that focuses on custom work, our goal is to tailor our services to each customer's individual needs. In fact, we welcome iron projects in Escondido of all sizes, from automated gate repairs to ornate perimeter fencing installation for large properties. With each project, we pay attention to the client's long-term goals, budget concerns, functional needs, and aesthetic preferences. By doing so, we not only achieve the satisfaction of our customers, but also earn the long-term loyalty of our customers and future referrals. Call today for a free, no-obligation consultation. For commercial customers in Escondido, B.A. 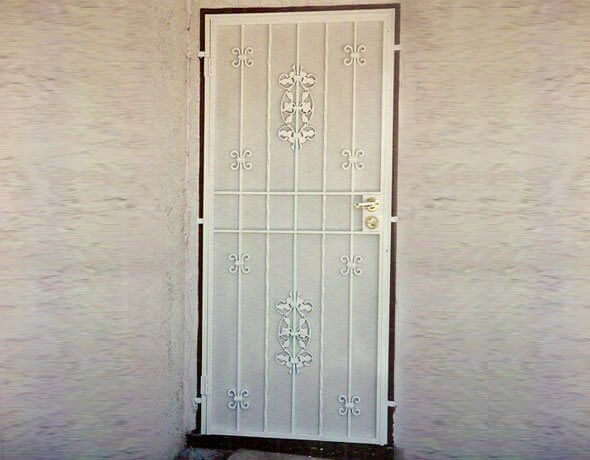 Ramirez & Sons Ornamental Iron Works, Inc. creates custom-designed iron fences, doors, gates, window guards, and doors. Our commercial ironwork ranges from the purely decorative to the highly functional. 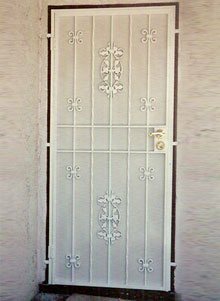 specialize in iron security solutions and can fit our iron security doors and window bars to any commercial space or budget. For our iron security fences and gates in Escondido, we provide speared and spiked toppers as well as access control hardware for our motorized fences. In addition, we offer businesses in Escondido safety ironwork, including our stairway and handicap rails which adhere strictly to current ADA code. Plus, we offer free design consultations and estimates, and always take the time to consider modifications that will enhance the overall beauty and value of your commercial property. Call the professionals at B.A. Ramirez & Sons Ornamental Iron Works, Inc. today for all of your Escondido commercial ironwork needs. Thank you for the fine craftsmanship you and your men did. I'll be calling you in the future for some more of the panels. D22 We completed a residential steel door installation in Escondido, CA. B.A. Ramirez & Sons created a screen door with a grape design for a client who wanted something simple. The 1" steel tube frame has a wall thickness of .083", which is almost twice the thickness of economy doors, and the metal screen is pre-galvanized. F7 BA Ramirez & Sons completed a commercial fence installation in Escondido, CA. The all steel tube-constructed fence features three horizontal rails and pointed tops to secure the yard behind it. This high quality, long lasting steel fence has been galvanized and powder coated. G13 B.A. Ramirez & Sons built and installed this custom iron gate in Escondido, CA. 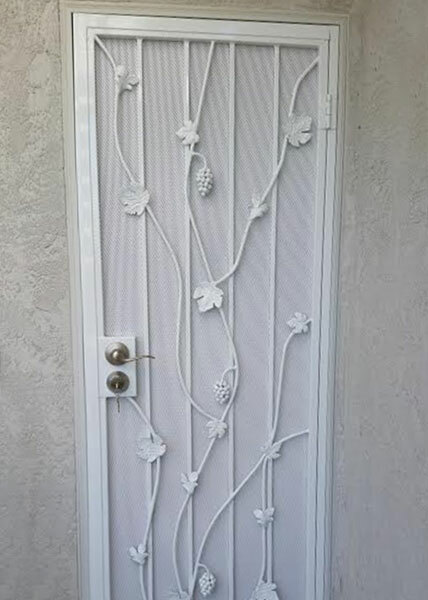 This iron gate installation features a custom leaf design with forged grape clusters. The vines are made from 1/4" round steel that was formed and shaped by hand. It is coated with zinc primer and a powder coat paint finish.